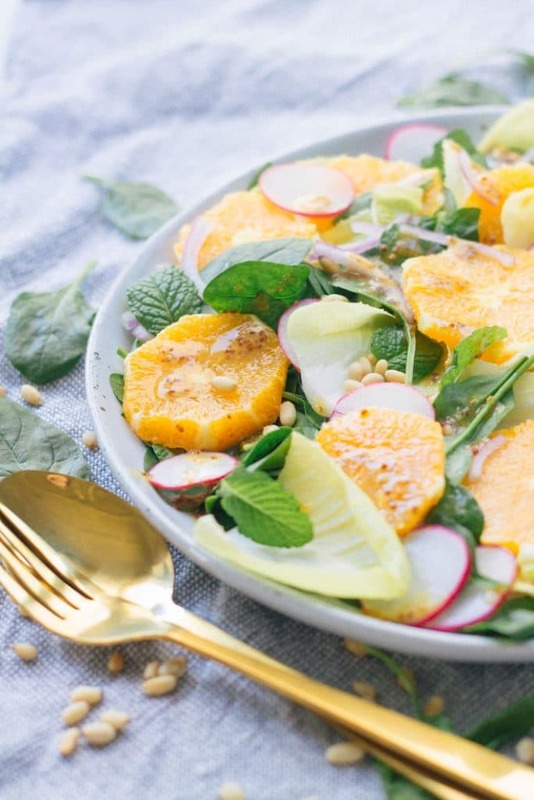 A delicious and quick salad for winter that is the perfect combination of sweet, bitter and crunchy. Great alongside a homemade pizza or big bowl of pasta! Jump to recipe. 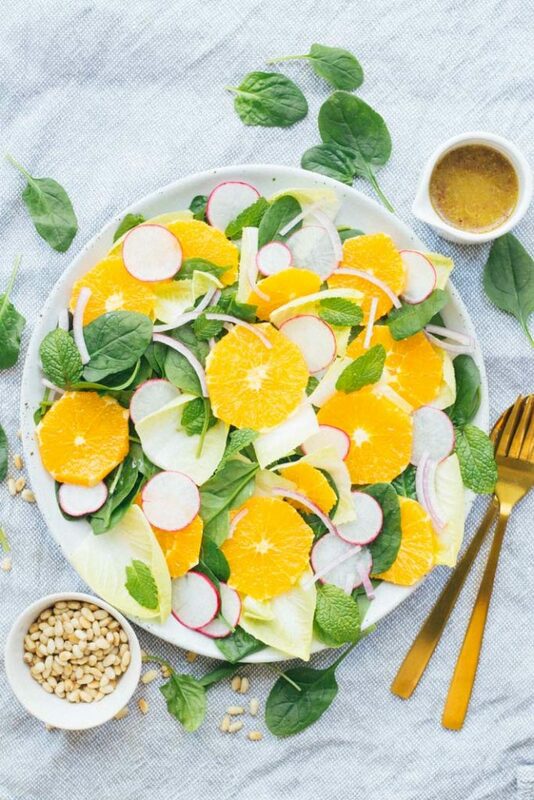 I call this my SUNSHINE SALAD! 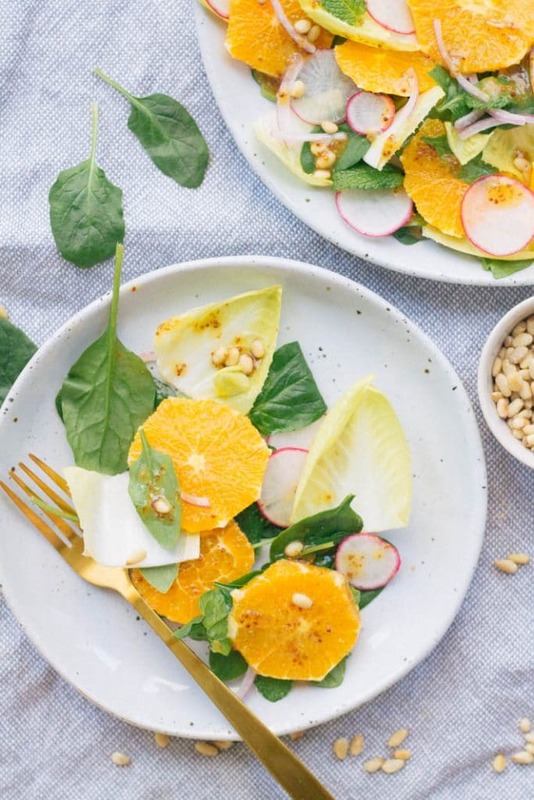 I know, it’s a little cheesy but at the end of winter it’s so nice to have this bright little salad that looks like a plateful of little suns. 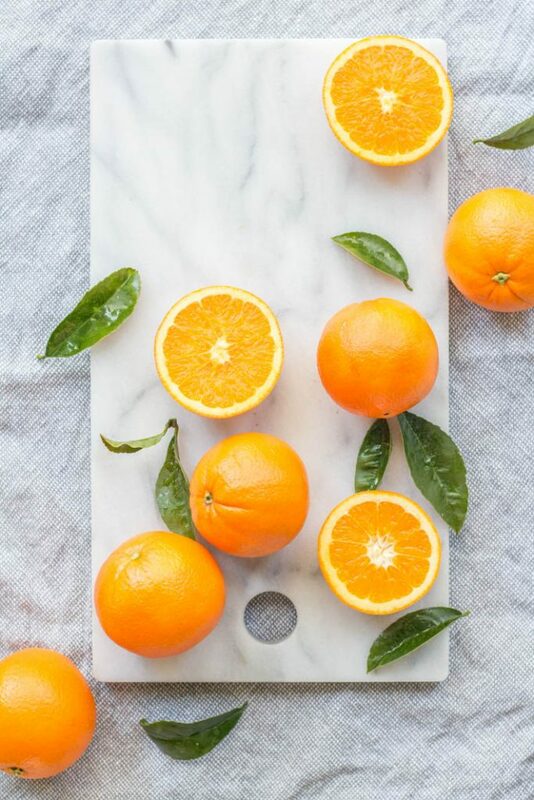 The sweetness and brightness of the oranges gives you an assuring feeling that spring is just around the corner! My two year old is currently obsessed with oranges. If an orange is put in front of him, literally seconds later it will have been vacuumed up. If he sees you with one then look out and let’s not even mention what he’s like if he sees orange juice! He’s quite excited by the prospect of visiting Granny and Pa next weekend because his big brother tells him that Granny always has juice. So committed is he to his love of oranges that he now eats every fruit like it is a piece of orange. He takes a pear or apple wedge, eats the middle then discards the outer skin. Like kids don’t already waste enough food! 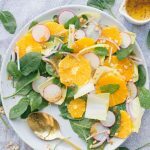 Needless to say, we now have a fruit bowl constantly overflowing with oranges, hence the inspo for this salad. 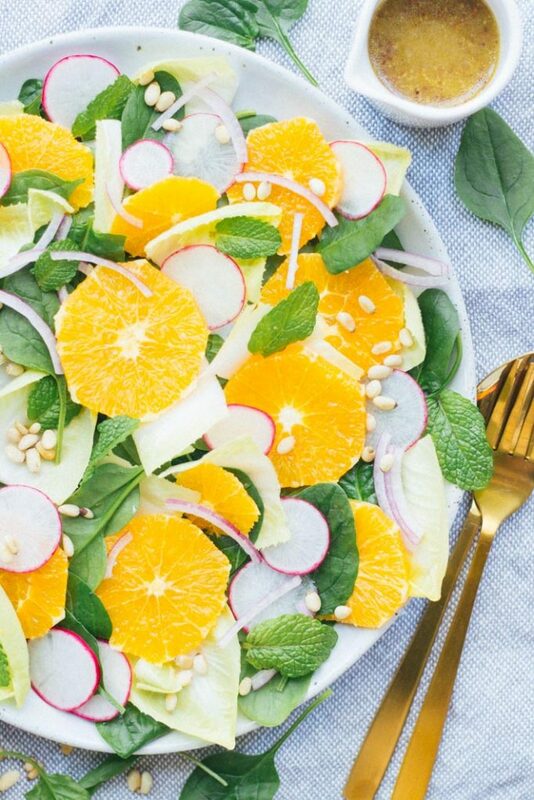 I’ve never been to Sicily but I like to think everyone there sits under olive groves on perfect summer afternoons eating this salad. I like to eat it alongside a homemade pizza (or takeaway one on a Friday night) or a big bowl of pasta. It’s even delicious alongside a piece of meat straight from the grill. 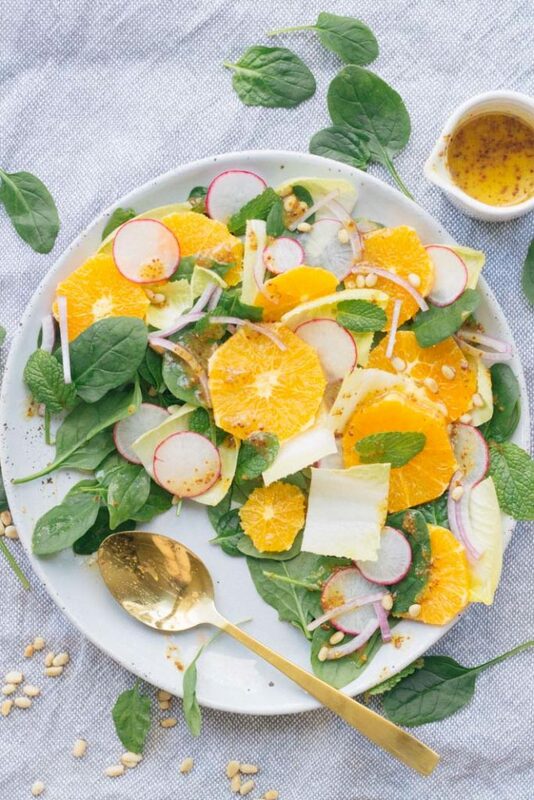 I’ve been a little obsessed with bitter greens this winter and they are just perfect in this salad alongside the sweetness of the oranges and honey in the dressing. If you don’t have baby spinach on hand then any salad green will do, but baby spinach is my favourite. Likewise, if you can’t find witlof then radicchio or any type of chicory will do. I hope this brings a little brightness to your day, not long now ’til spring! 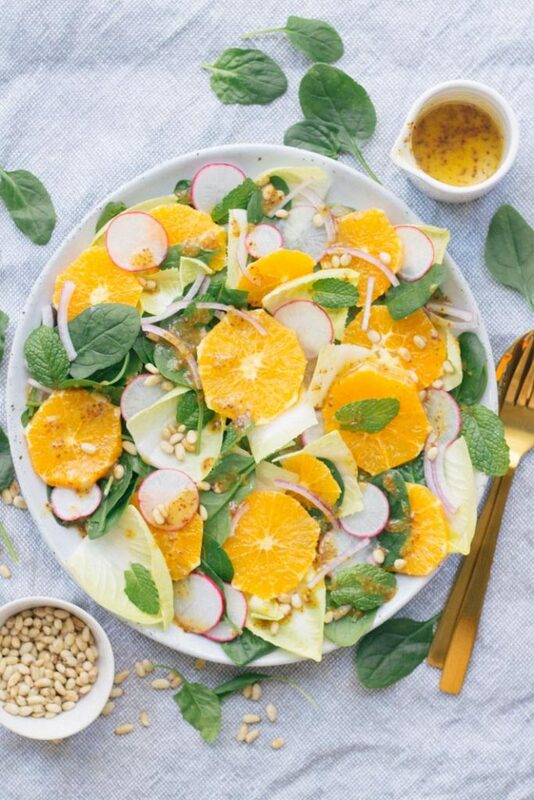 An easy to make salad that is the perfect balance of sweet oranges and crunchy bitter greens. Great alongside a pizza or big bowl of pasta. 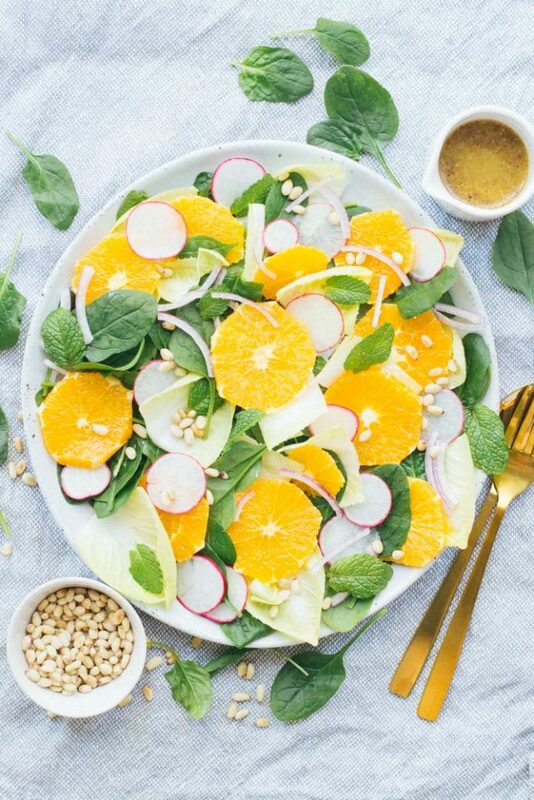 To make the dressing, place mustard, olive oil, vinegar, honey, salt and pepper in a small bowl and whisk to combine. Set aside. Place pine nuts in a dry fry pan over medium heat. Cook until pine nuts are just starting to brown, about 3-5 min, being sure to toss often. Once the start to brown remove from heat and transfer to a bowl and set aside. Ensure you keep a close eye on the pine nuts as they can burn easily. 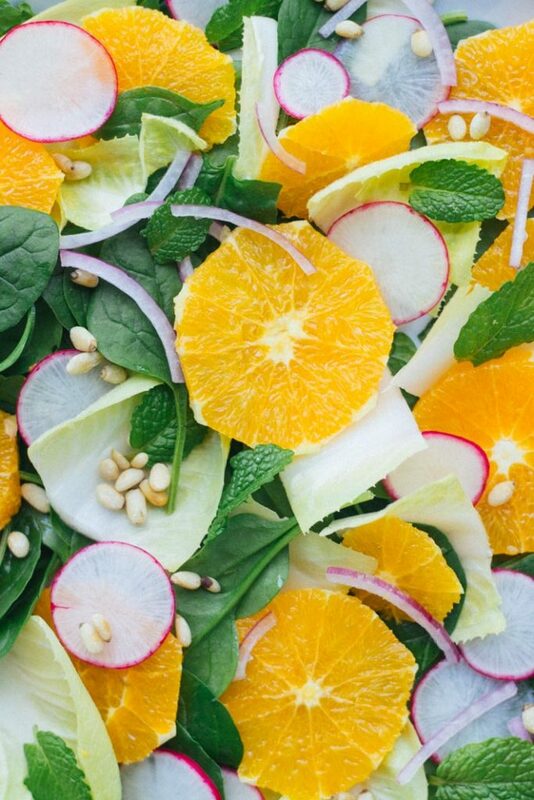 Arrange spinach, witlof, onion, oranges, radishes and mint leaves on a serving platter or in a salad bowl. 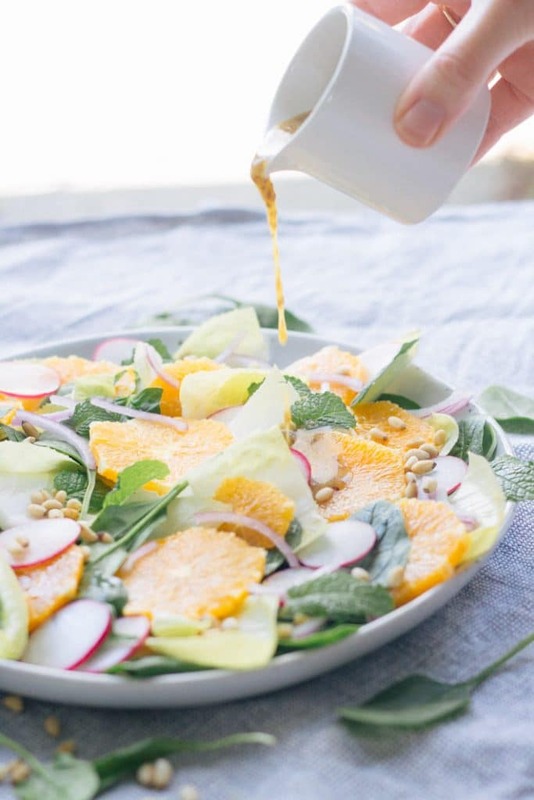 Scatter over pine nuts and drizzle over dressing. Serve immediately.